Chronic sinusitis and related conditions are a dominant medical problem in the United States and worldwide, with more than 30 million Americans affected annually at a cost of more than 4.3 billion dollars. [1, 2, 3] Over-the-counter remedies and prescription drugs account for much of the expense, yet provide minimal curative benefit in most patients with chronic sinusitis. Surgical treatment of sinus disease occurs with increasing regularity, at a current rate of approximately 800,000 cases in the United States per year. Chronic disease is a more insidious constellation of illnesses, not necessarily manifesting as fungal or bacterial infection. Many cases are related to other systemic illnesses such as asthma, connective tissue disorder, uncontrolled allergic or inflammatory disease, or systemic immunologic dysfunction. These procedures are performed when aggressive medical therapy does not resolve functional obstruction of normal sinus ostia by intranasal swelling, obstruction of the nasal passage itself by inflammatory disease such as polyps, or recalcitrant sinus opacification. Even with modern functional endoscopic techniques,  unfortunately, sinus surgery leaves much to be desired for many patients. Unlike certain other general surgical procedures for infection prevention and treatment, such as appendectomy or cholecystectomy, sinus surgery for chronic sinusitis is often performed multiple times on a single patient and is rarely deemed to be curative. In sinus surgery, the affected organ is not removed; in fact, it may be made more diseased by a poorly performed operation. Scar tissue formation, recurrence and persistence of inflammatory or infectious conditions in the nose and sinuses, and untreated systemic illness all doom many sinus patients to failure and recurrent operation. Surgeons have increasingly recognized the importance of preserving or restoring normal sinus anatomy. For example, early efforts to establish indirect or gravity-related drainage of the maxillary sinuses, by Caldwell-Luc or inferior meatal window procedures, have since been realized to confound the natural mucociliary clearance of the sinus and have largely been abandoned. The more anatomic and physiologic method of reopening and enlarging the natural drainage pathways from the sinuses to the nasal passages is the basis of modern FESS. The FESS of today differs significantly from the sinus surgery performed even a few years ago. Advanced fellowship training in rhinology and sinus surgery, offered by a dedicated rhinology faculty, is becoming more prevalent. Understanding of mucociliary clearance, the relationship between sinus and pulmonary function, and the allergic and immunologic properties of the sinuses and nose have developed significantly. Balloon sinus dilation (BSD) represents the first step toward tissue preservation technique and away from the destructive access techniques necessary for FESS. Much like angioplasty is used to open coronary arteries and avoid bypass graft surgery, BSD offers patients with chronic sinusitis the possibility of complete preservation and restoration of the native sinus anatomy. The indications for balloon sinus dilation (BSD) treatment for sinus disease are the same as those for standard functional endoscopic sinus surgery (FESS). Like FESS, BSD is intended to allow as permanent as possible access to and ventilation of obstructed sinuses, thereby allowing normal function to resume and ongoing maintenance therapies to be effective. 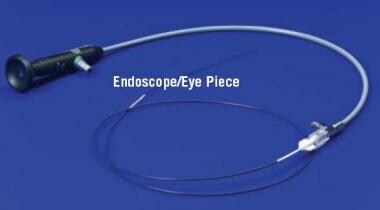 For more information, see Functional Endoscopic Sinus Surgery. However, BSD by itself is appropriate for only a subset of patients who qualify for FESS. Since BSD is used solely for dilation of obstructed ostia, its use is limited to the frontal, sphenoid, and maxillary (ie, extranasal) sinuses. BSD may be considered the treatment of choice for limited or moderate disease involving these sinuses. In patients with significant ethmoid disease, BSD can be used as an adjunct to standard ethmoidectomy. BSD is performed either before or after ethmoidectomy, depending upon the preference of the surgeon to preserve normal anatomy for BSD landmark purposes. Patients with pansinus polyposis, extensive fungal disease, advanced connective tissue disease, or suspected neoplasm should not be considered for BSD as the principal modality. Opacification of a sinus by solid tissue inhibits view and access with the Entellus device, and such disease cannot be cleared with either the Entellus or the Acclarent device. The surgeon must consider that the access to these sinuses afforded by dilation of the native ostium would likely be inadequate for extirpation of disease or for maintenance of drainage postoperatively with topical treatment. BSD is not appropriate for use in patients who require revision surgery or in those with severe disease in which bony thickening or dehiscence of the orbital wall or skull base bone have occurred. No surgical treatment should be offered in the absence of comprehensive medical treatment, including antibiotics, steroids, nasal hygiene, and liberal use of topical nasal therapies. For more information on these therapies, see Chronic Sinusitis. Even in patients who have received extensive treatment by a primary care practitioner, insurance payors often require further aggressive medical treatment under the specific direction of the subspecialist before authorizing surgical treatment. The key nasal sidewall and roof structures, including the uncinate process, the ethmoidal bulla, and the middle and superior turbinates, serve as guides to find the maxillary, frontal, and sphenoid ostia. See the images below. 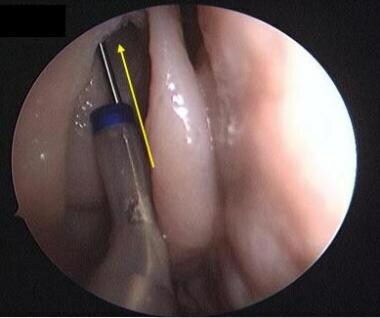 Endoscopic view of sinus ostia location in the lateral nasal wall. Cadaveric anatomy of the lateral nasal wall. The ethmoid bulla is a constant landmark during endoscopic surgery and is usually the largest of the anterior ethmoidal cells. It lies posterior to the uncinate process, superior to the infundibulum, and anterior to the basal lamella. The ethmoid bulla often extends all the way to the skull base but sometimes is attached to the skull base via the bulla lamella. 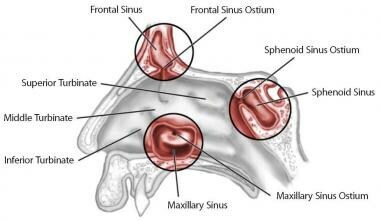 The sphenoid sinus ostium is in the posterior nasal cavity approximately 1.5 cm above the roof of the nasal pharynx. 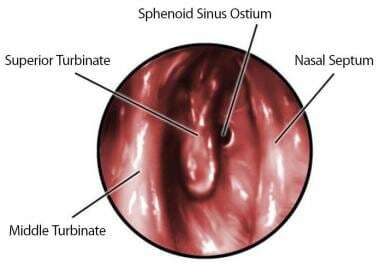 It is generally medial to the superior turbinate. See the image below. Expected location of the sphenoid ostium. A recent cadaver study has demonstrated uniform location of the ostium in this medial location. This challenges historic and practical experience that sometimes (approximately 15% of the time), the most straightforward access to the sphenoid is lateral to the superior turbinate. Regardless,, the surgeon should initiate the search for the ostium as medially and inferiorly as possible to minimize bleeding, tissue injury, or other risk to the skull base, optic apparatus, internal carotid, cavernous sinus, or pituitary sella. The traditional depth measurement for the sphenoid sinus wall is 7 cm from the nasal sill; this is helpful when accessing a difficult sphenoid sinus through a narrow nasal cavity or past large turbinate structures. The sinus access is typically 30 degrees elevated from the nasal floor using angulation from the sill. Trajectory-based identification of angle and depth becomes less important when performing lateral fluoroscopy for BSD, as described in the Technique section below, than when using a lighted guidewire to enter the sinus with a more indirect indication of true sinus entry. Preoperative evaluation of CT imaging in multiple planes identifies Onodi or sphenoethmoid cells that may obscure or obstruct sphenoid access or later outflow. [13, 14] The presence of these cells may also jeopardize safe instrumentation of the sinus. Intramaxillary sinus anatomy, which is seen with the Entellus device, is different than that familiar to the surgeon trained to perform standard FESS. 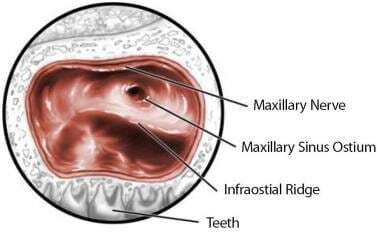 Native internal maxillary sinus anatomy is rarely seen in the course of traditional nasal or head and neck surgery, but it is seen in microscopic detail in the passing of a camera and balloon into the maxillary sinus and subsequently through the ostium in the medial maxillary wall. For more information about the relevant anatomy, see Paranasal Sinus Anatomy, Nasal Anatomy, and Skull Base Anatomy. Balloon sinus dilation (BSD) needs to be performed in a setting that provides adequate patient and surgeon comfort and sufficient equipment resources to respond to BSD failure or other unexpected challenges. In most practice situations, BSD is performed only in an operating room with the patient under general anesthesia. In rare instances, BSD may be performed in an office environment with an awake patient under local anesthesia. Ambulatory and office-based BSD have both medical and economic pitfalls. Reimbursement may be problematic, as payors in most communities only contract for hospital-based usage of BSD devices by pass-through consumable allowance. On the other hand, if performance of BSD in the clinic setting demonstrates sufficient cost savings, this could result in the erosion of future privilege to perform the procedure in a hospital or operating room setting, because of mandates from payors. Anesthesia for balloon sinus dilation (BSD) is generally the same as that used for functional endoscopic sinus surgery (FESS). In most instances, the procedure is performed under general anesthesia in an operating room. Certain patients receiving treatment with the Entellus device or focal office-based treatment with the Acclarent devices may be comfortably treated with liberal local anesthesia alone. Patients undergoing BSD while conscious should receive local anesthesia with lidocaine 1% with epinephrine 1:100,000.This can be injected regionally near the sites of the ostia and also as a transpalatine block through the greater palatine foramen transorally. Postoperative discomfort is generally minimal, making longer-acting agents such as bupivacaine unnecessary. Acclarent sidekick guide catheter holder. Two BSD devices are currently approved by the US Food and Drug Administration: the Acclarent (Menlo Park, Calif) family of devices and the Entellus (Maple Grove, Minn) device. The Entellus device (see the images below) is used only for maxillary sinus obstructive disease, while the Acclarent devices are available for frontal, sphenoid, and maxillary disease treatment. The Entellus devices rely upon a trocar system for anterior maxillary wall puncture and flexible fiberoptic light delivery and endoscopic viewing of the internal maxillary anatomy. Multiple sinuses may be treated with a single BSD device, allowing affordable and efficient treatment of chronic pansinusitis. Fully opacified, infected sinus cavities may be treated with the Acclarent devices utilizing an irrigation catheter to clear infected debris by retrograde flushing after the sinus ostium has been dilated. Positioning for BSD is the same as for FESS. For office-based procedures, a standard examination chair suffices for most patients. Surgical preparation begins with in-servicing and training of a competent operating room team. Manufacturers of both the Acclarent and Entellus devices routinely provide cadaver and lifelike artificial model training to surgeons for balloon sinus dilation (BSD). They also comprehensively educate the circulating nurse and scrub technologist in inventorying and using the array of devices needed to perform BSD in all sinuses in a wide variety of anatomic variability. The surgeon performing BSD of multiple sinuses should consider working from a posterior-to-anterior approach in order to minimize operative bleeding into the endoscopic surgical field. If necessary, sphenoid disease should be treated first, followed by maxillary, then frontal BSD. Angled telescopes are useful in almost all instances for viewing sinus ostia, which are often obscured by normal ethmoid and turbinate anatomy. Position the patient head-to-foot reversed on the operating room table to avoid C-arm obstruction by the table pedestal. Position the sending unit (radiation source) opposite the surgeon when performing cross-table lateral fluoroscopy. See the image below. Prior to performing the intranasal approach and for visualization of the endonasal result with the Entellus device, administer topical intranasal decongestion with oxymetazoline (Afrin), phenylephrine (Neo-Synephrine), or dilute epinephrine. Enhance safety by staining any topical fluids with the fluorescein used by ophthalmologists (available in most operating rooms in topical wick form). This mitigates the concern of accidental injection of cardioactive agents. Some surgeons use epinephrine in concentrations as high as 1:1,000 for aggressive nasal congestion, but inadvertent injection of this into nasal tissues could be devastating. Dilation of the sphenoid ostium begins with insertion of a straight or 30-degree angled guide catheter medial to the middle turbinate into the angle between the septum and superior turbinate. Advancement of the catheter as far posterior as the posterior ethmoid wall is not necessary and often hinders easy identification of the sinus ostium. Maintaining the catheter at a distance from the sphenoid wall allows a small curve on the guidewire to assist in seeking the sinus ostium by gentle advancement. Several passes may be needed in varying trajectories to locate the ostium. See the image below. Maintaining a distance from the target ostium broadens the available search pattern for the guidewire. 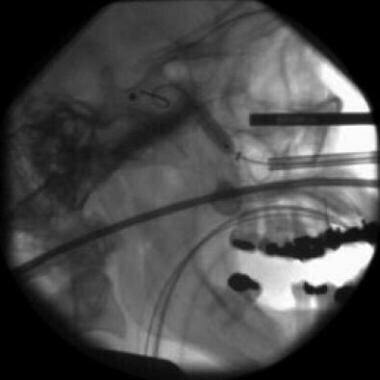 Verify sinus entry by lateral fluoroscopy (see the image below) or transillumination of the sphenoid floor as viewed from a vantage either above the guide catheter or below looking upward at the nasopharyngeal roof. When employed, strong transillumination must be seen to confirm that the wire is not in an Onodi or posterior ethmoid cell, if these structures are visualized preoperatively on the CT scan. Lateral fluoroscopy view demonstrating sphenoid guidewire location and inflated BSD device. When wire positioning in the sinus has been confirmed, advance the balloon catheter through the guide catheter to place the balloon in a position that spans the sinus ostium with equal lengths of the balloon in the nasal cavity and in the sinus. If using a light-guided catheter, estimate the positioning by visualizing the proximal end of the balloon exiting the guide catheter and entering the sinus ostium. 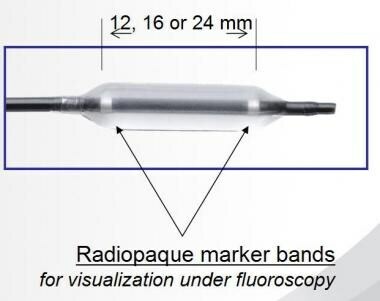 In the case of fluoroscopic guidance, use radiopaque guide markers at the proximal and distal end of the balloon to determine appropriate balloon position relative to ostium bone. This is more straightforward in the sphenoid than in the other sinuses, since the sphenoid anterior wall is generally thin and uncomplicated topographically. After positioning, inflate the balloon under direct visualization to a final diameter of 4-7 mm at a pressure typically between 8 and 12 atmospheres. This is adequate to expand all bony and scar tissue obstruction to achieve sinus patency. Deflate the balloon immediately. Prolonged inflation of the balloon does not facilitate improved result and may precipitate worsened postoperative edema from tissue ischemia. 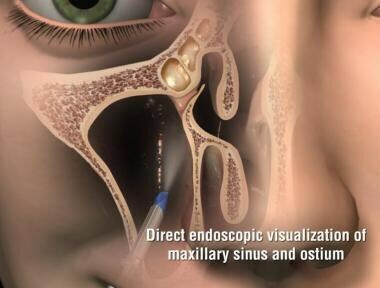 Withdraw the device and visualize the sinus ostium directly. Irrigation may then be performed by direct view of the sinus cavity through the enlarged ostium. Maxillary sinus treatment is accomplished by either antegrade or retrograde passage of a wired-guided catheter, depending upon the vendor used and surgeon preference. Deploy the Entellus system by entry into the maxillary sinus through a puncture in the anterior maxillary wall in the vicinity of the canine fossa. This is performed in much the same manner of antral puncture or "tap" that is familiar to most otolaryngologists from residency training. Prior to insertion of a sharp trocar through the gingival mucosa, inject local anesthetic and vasoconstrictor into the oral and nasal mucosa. Advance the trocar to contact bone lateral to and superior to the canine tooth root and well inferior to the maxillary branch of the trigeminal nerve as it exits the infraorbital foramen. 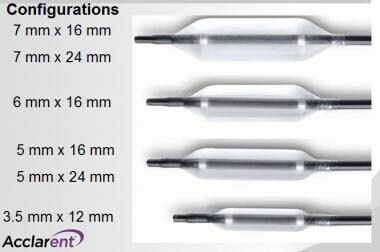 Experience with the Entellus system will lead the surgeon to make more lateral trocar entry points than might be initially attempted. A more lateral approach affords a better panoramic view of the medial maxillary wall where the inferior anatomy, including the infraostial ridge, may obstruct view in too medial an entry. See the image below. Schematic of intrasinus view of the medial maxillary wall demonstrating key landmarks. After a puncture is made with the trocar, angle the sheath of the trocar increasingly parallel with the anterior maxillary wall by depressing the handle of the device toward the maxillary teeth while slightly twisting the device. This is necessary to view the internal maxillary ostium, which can be quite high and anterior in the medial maxillary wall. A cutting flute on the outside diameter facilitates this maneuver and helps to lock the trocar sheath into place in the anterior maxillary bone. When sinus access has been gained and adequate visualization is accomplished with a small flexible fiberoptic telescope, cannulate the internal maxillary ostium with the bent tip of the integrated guidewire/balloon assembly. See the images below. Endoscopic view of the natural maxillary sinus ostium as seen from within the maxillary sinus above the infraostial ridge. Entry into the maxillary sinus with the Entellus device. Dilation of the maxillary ostium with the Entellus device. 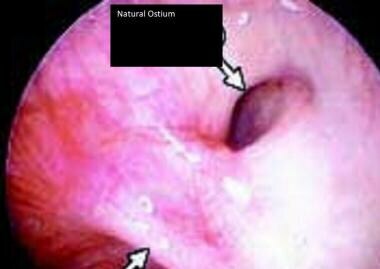 Irrigation of the sinus to clear blood or secretions may be necessary to allow view of the ostium. Endoscopic intranasal view after deployment of the Entellus often reveals a medialized uncinate process, behind which can be visualized a patent maxillary ostium. The Acclarent device accomplishes similar results without the need for transoral puncture but with the need for either fluoroscopy or transillumination apparatus. As with the sphenoid approach, the first step in access is to place a guide catheter under direct view with endoscopy in the vicinity of the natural maxillary ostium. The available guides are either 90 or 110 degrees in curvature to conform to the anatomy of the anterior face of the bulla and the posterior surface of the uncinate process. The maxillary ostium is found behind the uncinate process and anterior to the ethmoidal bulla as described earlier. 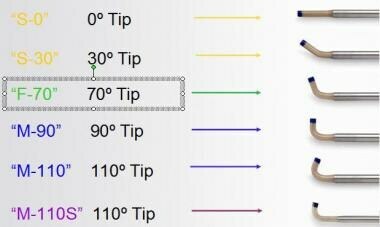 Recall that the orientation of the maxillary ostium more closely approximates the horizontal plane than the parasagittal or vertical, so placement of the catheter tip and curvature of the guide should be directed inferiorly. Placement of the guide in this position is usually facilitated by insertion of the catheter with the tip directed upward into the nostril to the plane behind the uncinate, then lateral rotation past horizontal to approximately 110 degrees. Gentle and sequential advancement and withdrawal of the curved guidewire ultimately results in wire passage into the sinus. Fluoroscopy may be used to facilitate sinus entry with the wire, demonstrating error in trajectory or passage of the wire out of the hiatus semilunaris into the nasopharynx rather than into the sinus. Confirm appropriate location by fluoroscopy in the posteroanterior (PA) plane or by transillumination of the anterior maxillary sinus wall by a lighted guidewire. This facilitates identification of the sinus ostium. 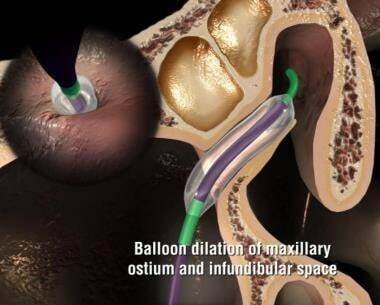 Advance the balloon through the guide, over the wire, and out of the end of the catheter to span the sinus ostium. Improper positioning of the balloon in the sinus ostium may result in inadvertent squeezing of the balloon into or out of the sinus as it is inflated, which requires balloon deflation and repositioning. 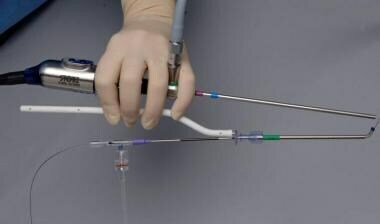 This can be avoided by pinching the balloon catheter between fingertips at its proximal insertion in the guide while holding the guide stable during inflation. After inflation to predetermined diameter and appropriate pressure, immediately deflate the balloon and visualize the ostium with an angled telescope. A 70-degree telescope may be necessary to view the ostium. Atraumatic and reliable access to the frontal sinus is the most promising aspect of BSD, for both surgeons and patients. For enthusiasts of FESS and frontal sinus anatomy, BSD offers a refreshing perspective on the native frontal recess. The various obstructive cells will be deliberately left in place and worked around to gain sinus access. Several cells, such as intersinus septal cells and supraorbital cells, may require attention and dilation. Frontal sinus BSD is depicted in the video below. Frontal sinus balloon dilation. In this video, ethmoidectomy has been performed. The malleable portion of the device is used as a probe within the frontal recess. After it slides into the frontal sinus, the balloon is inflated. Endoscopic visualization will confirm that the frontal sinus opening has been dilated, and the bone chips are removed prior to completion of the procedure. Video courtesy of Vijay R Ramakrishnan, MD. The procedure is similar to that of sphenoid and maxillary access. Proximity of the guide catheter to the true sinus ostium is not necessary for ease of cannulation. Preoperative review of the CT scan and availability of the scan in the operating room is most needed in this instance. The guide is generally placed behind the axilla of the middle turbinate, posterior to the uncinate, and anterior to the ethmoidal bulla. See the image below. Appropriate technique for BSD of the frontal outflow. The search for the sinus ostium generally proceeds from medial to lateral, although difficulty can be encountered if variation in anterior-to-posterior dimension is not considered or explored. To accomplish this, vary the angle of the guide catheter with respect to the nasal floor. Ultimately, enter the sinus with the wire, either by trial with fluoroscopy or with lighted guidewire. 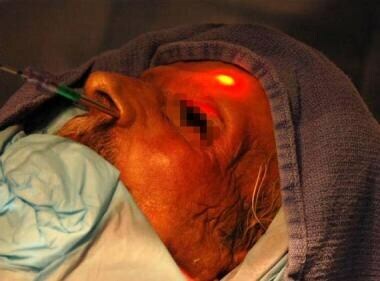 When the sinus is properly cannulated, bright frontal transillumination is present. See the image below. Transillumination confirming appropriate frontal lighted guidewire placement. The frontal recess is much longer and often more tortuous than the ostia of the other sinuses. A 24-mm balloon may be necessary to dilate the full length of the outflow. Alternatively, sequential advancements and dilations can be performed with a shorter or smaller balloon. The length of the outflow and its response to dilation are plainly evident on fluoroscopy, either lateral or PA; indentation in the balloon as it is inflated demonstrates whether further dilations are necessary. 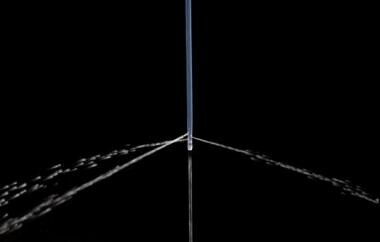 Lighted guidewire requires more inference as to the success of initial dilation. In both instances, postdilational endoscopy confirms patency of the recess. Lighted guidewire placement and efficiency relies upon visualization of the proximal end of the balloon as high as possible in the anterior ethmoid roof. See the image below. 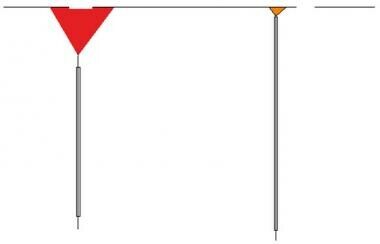 Correct balloon location in the frontal outflow to maximize dilated segment length. Several refinements to the Acclarent device have been developed to provide the surgeon the maximum maneuverability of the guide and guidewire into the target sinus. 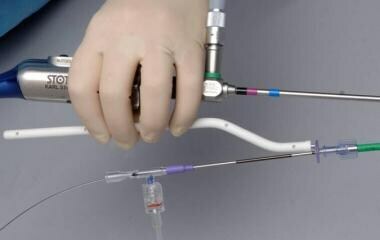 An integrated handle device that can be manipulated between central fingers of the scope hand allows the surgeon to stabilize the guide while the other hand is free to manipulate the guidewire and balloon with maximum tactility. 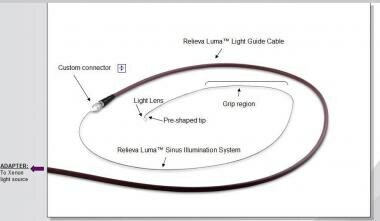 This is referred to by the manufacturer as the Relieva Sinus Guide Catheter Handle. See the image below. Flexible Sidekick catheter handle for single-handed use with endoscope for maximum guidewire tactile manipulation. Dilation of the maxillary sinuses with the use of the Sidekick device is best accomplished with specific rotational positioning of the flexible handle prior to insertion into the nasal cavity. See the image below. The guidewire handle in position for manipulating the guidewire. The Relieva Solo Sinus Balloon Catheter allows the surgeon to advance the balloon through the guide much like the plunger of a syringe, allowing easier balloon positioning. This is accomplished with force applied against the Luer-lock hub attached to the side of the proximal end of the catheter while the catheter tip is advanced through the guide. See the image below. 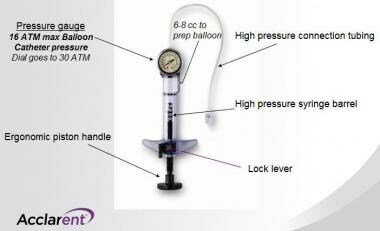 Luer-lock configuration on the balloon catheter for application of pressure during insertion. 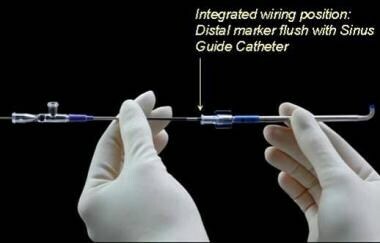 The use of the Sidekick and Solo devices with a lighted guidewire is also made easier by a series of markings on the balloon catheter for correct predeployment configuration and predilation inserted depth. See the image below. Markings on the BSD balloon catheter. Increasingly larger series with lengthier follow-up with patients who underwent Acclarent balloon sinus dilation (BSD) have been recently published. [18, 19] The per-sinus major complication rate is estimated at 0.0035%. To date, only 3 reports of complications have arisen from a body of 85,719 reported sinuses treated. This compares exceptionally well with the historic FESS complication rate of approximately 1%. Follow-up for BSD should be identical to that of FESS, with the exception that the expensive and painful practice of full sinus endoscopic debridement is less often necessary. National Center for Health Statistics. Sinus Conditions. CDC Web site. Available at http://www.cdc.gov/nchs/fastats/sinuses.htm. Reed SD, Lee TA, McCrory DC. The economic burden of allergic rhinitis: a critical evaluation of the literature. Pharmacoeconomics. 2004. 22(6):345-61. [Medline]. Anand VK. Epidemiology and economic impact of rhinosinusitis. Ann Otol Rhinol Laryngol Suppl. 2004 May. 193:3-5. [Medline]. Tomazic PV, Stammberger H, Braun H, Habermann W, Schmid C, Hammer GP, et al. Feasibility of balloon sinuplasty in patients with chronic rhinosinusitis: the Graz experience. Rhinology. 2013 Jun. 51(2):120-7. [Medline]. Patel A, Vaughan WC. Sinusitis, Maxillary, Chronic, Surgical Treatment. Medscape Reference [serial online]. March 6, 2008. [Full Text]. Bolger WE, Vaughan WC. Catheter-based dilation of the sinus ostia: initial safety and feasibility analysis in a cadaver model. Am J Rhinol. 2006 May-Jun. 20(3):290-4. [Medline]. Brown CL, Bolger WE. Safety and feasibility of balloon catheter dilation of paranasal sinus ostia: a preliminary investigation. Ann Otol Rhinol Laryngol. 2006 Apr. 115(4):293-9; discussion 300-1. [Medline]. Bolger WE, Brown CL, Church CA, Goldberg AN, Karanfilov B, Kuhn FA. Safety and outcomes of balloon catheter sinusotomy: a multicenter 24-week analysis in 115 patients. Otolaryngol Head Neck Surg. 2007 Jul. 137(1):10-20. [Medline]. Raghunandhan S, Bansal T, Natarajan K, Kameswaran M. Efficacy & outcomes of balloon sinuplasty in chronic rhinosinusitis: a prospective study. Indian J Otolaryngol Head Neck Surg. 2013 Aug. 65:314-9. [Medline]. [Full Text]. Millar DA, Orlandi RR. 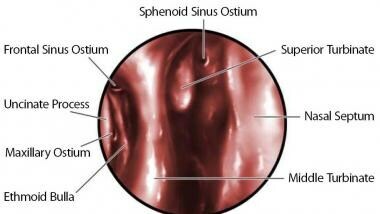 The sphenoid sinus natural ostium is consistently medial to the superior turbinate. Am J Rhinol. 2006 Mar-Apr. 20(2):180-1. [Medline]. Kim HU, Kim SS, Kang SS, Chung IH, Lee JG, Yoon JH. 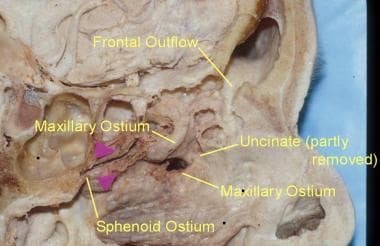 Surgical anatomy of the natural ostium of the sphenoid sinus. Laryngoscope. 2001 Sep. 111(9):1599-602. [Medline]. Batniji RK, Marrinan MS. Sinusitis, Sphenoid, Acute Surgical Treatment. Medscape Reference[serial online]. Medscape Reference. Available at http://emedicine.medscape.com/article/862435-overview. Accessed: Jan 2, 2009;. Onodi A. The optic nerve and the accessory sinuses of the nose: A contribution of canalicular neuritis and atrophy of the optic nerve of nasal origin. Ann Otol Rhinol Laryngol. 17:1-116. Driben JS, Bolger WE, Robles HA, Cable B, Zinreich SJ. The reliability of computerized tomographic detection of the Onodi (Sphenoethmoid) cell. Am J Rhinol. 1998 Mar-Apr. 12(2):105-11. [Medline]. Kuhn FA, Church CA, Goldberg AN, Levine HL, Sillers MJ, Vaughan WC, et al. Balloon catheter sinusotomy: one-year follow-up--outcomes and role in functional endoscopic sinus surgery. Otolaryngol Head Neck Surg. 2008 Sep. 139(3 Suppl 3):S27-37. [Medline]. Friedman M, Schalch P, Lin HC, Mazloom N, Neidich M, Joseph NJ. Functional endoscopic dilatation of the sinuses: patient satisfaction, postoperative pain, and cost. Am J Rhinol. 2008 Mar-Apr. 22(2):204-9. [Medline]. Wynn R, Vaughan WC. Postoperative recovery: FESS with balloon sinuplasty device. Otolaryngol Head Neck Surg. 135(2):P151. Koskinen A, Myller J, Mattila P, Penttilä M, Silvola J, Alastalo I, et al. Long-term follow-up after ESS and balloon sinuplasty: Comparison of symptom reduction and patient satisfaction. Acta Otolaryngol. 2016 Feb 5. 1-5. [Medline]. Bizaki AJ, Taulu R, Numminen J, Rautiainen M. Quality of life after endoscopic sinus surgery or balloon sinuplasty: a randomized clinical study. Rhinology. 2014 Dec. 52 (4):300-5. [Medline]. Melroy CT. The balloon dilating catheter as an instrument in sinus surgery. Otolaryngol Head Neck Surg. 2008 Sep. 139(3 Suppl 3):S23-6. [Medline]. 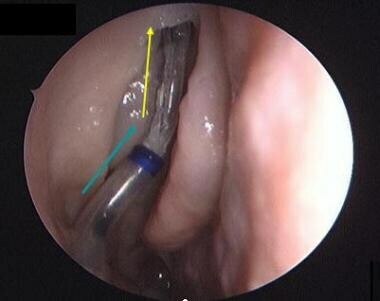 Mucus recirculation around an accessory sinus ostium in anterior to the uncinate process. Mucus recirculation around an accessory ostium in the inferior medial maxillary wall, before and after suctioning away purulent evidence. Septations in bilateral maxillary sinuses. Disclosure: Received honoraria from Acclarent, Inc. for speaking and teaching.